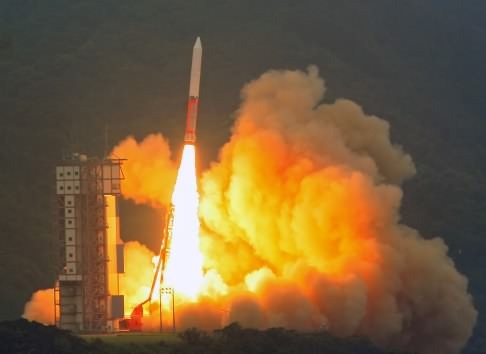 The Japan Aerospace Exploration Agency (JAXA) has successfully launched a new X-ray astronomy satellite Astro-E2 from Uchinoura Space Center at 12:30(JST) on July 10 onboard the M-V-6 rocket. The perigee was 247 km, the apogee was 560 km, and the inclination angle was 31.4 degrees just after the launch. Now we are conducting operations to raise the perigee and to establish the attitude control system. It is newly named Suzaku. Astro-E2 is the fifth Japanese X-ray astronomy satellite to observe X-rays from hot and active regions in the Universe. It is equipped with X-ray telescopes and 3 kinds of detectors to perform broad band observations and high resolution spectroscopy. The spectrometer has an energy resolution that is an order of magnitude better than those of previous instruments, enabling us to study in detail the emission lines from hot plasmas. The dynamics of hot gases in clusters and in the vicinities of black holes can be examined by the shift of lines due to the Doppler effect. Astro-E2 is the re-fly of Astro-E, which could not be lifted to orbit because of the trouble of the launch vehicle in 2000. This mission has been prepared in collaborations with Japanese universities and institutions and NASA Goddard Spade Flight Center. Observation programs are planned based on the discussion in the science working group and also on the proposals submitted from all over the world. Astro-E2 will provide capabilities complementary to those of current X-ray observatories, such as Chandra (NASA) and XMM-Newton (ESA), and is expected to be a great asset for X-ray astronomers world-wide. At the end, we, Suzaku team, would like to appreciate the support by JAXA/ISAS, Japanese and US universities, institutes, and industries who produced Astro-E2.